When we were still in Hawaii the idea of a homebirth seemed really out of reach. I knew in my heart that's what I wanted but the cost seemed too much, and I had an excellent relationship with one of the OBs I've worked with (3 of my blogged birth stories feature him). I switched my insurance to allow off post visits and began planning a natural hospital experience. I trusted my doctor to be hands off unless it was necessary and all was good. Surprise! Charlie's school packet had been in for months and we didn't hear anything- meaning we needed to proceed with a PCS move to Missouri. We had hoped he would be accepted and me and the kids would stay behind in Hawaii while he went to school, but this was still neat. I'd actually been the one to push for Missouri and was excited to see snow. I started researching my birth options in our new home and reached out to Mrs Terina of Safe Journey's Midwifery. We met her for coffee and instantly clicked. She explained the process and how insurance would (hopefully) work, and we scheduled our first appointment. Having my prenatal visits in the comfort of my own home was awesome! No waiting rooms, or driving when I was feeling icky (which I felt a LOT of this pregnancy). Around week 36 the birth pool was dropped off and I had all of my birth kit supplies, and it was just a waiting game. I was fully prepared to go to 42 weeks this time and not rush if baby wasn't "on time". The day before my "due date" I woke up at 6:15 am and couldn't go back to sleep. I was having pretty regular contractions, but I didn't want to get my hopes up much. The night before I had eaten some pineapple and watched Call the Midwife just for giggles to see if things would start moving along and sure enough, by 8:00 am I felt like they were the real deal. I shot Lydia a text to let her know this might be the day (she was driving 4 hours to come and wanted to make sure she had ample time). I gave Mrs. Terina a heads up as well, and took a hot shower, timing my contractions. They definitely didn't go away- if anything the shower made them get stronger. 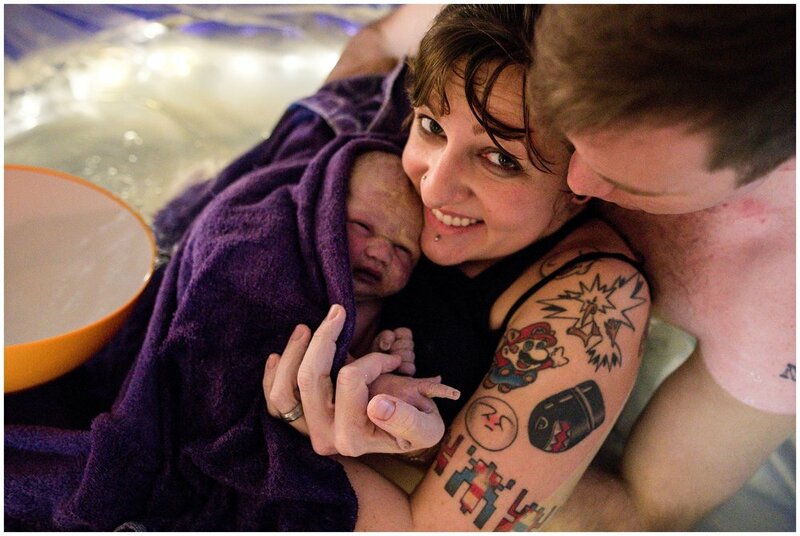 I labored on, and Dannielle (of Dannielle Hale, Storytelling Photography) arrived shortly after my midwife did. I was so surprised to find out I was already dilated to a 5/6, and would for real be having the baby that day! The pool got set up and Charlie helped me work through my contractions. Honestly, although they were painful and intense, they only lasted for 45-60 seconds and as soon as it was over, it was a feeling of relief. I went about the day talking to everyone and even put on the Talking Heads, Stop Making Sense to labor to. Lydia arrived around 1PM, and by 3 I was in the pool. Things were getting much more intense by that point and the water felt AMAZING. Charlie soon got in and before long I was fully dilated. I pushed for about an hour- which was the worst part of it all, not going to lie, and at 5:09 PM Madeline Rose was born in the sac or en caul. It's apparently super rare- about 1 in 80,000 babies are born that way! She was 9 pounds 1 ounce and 20.5 inches long. Thanks for making it to the end! <3 All photography and video is credited to Lydia Stuemke - family films with help from Dannielle Hale - Storytelling photographer.